This lesson isn’t going to deal with writing harmonies, so much as what to do with them once we have them. We’ll cover two simple concepts that will give awesome results for your writing. You can review part 1 here. Let’s say we are playing this harmony over the chord E5. This will sound cool repeated a few times in a row … but will quickly start to get a bit boring. One way we can make it really interesting is to change the harmony that we are playing over – change what the rhythm guitar (or bass) is playing. In order to do this, we need to know the key (E minor / G major for working out chords). Once we know the key, we can take power chords from it almost at random and they will work pretty nicely over our harmony (note that the diminished chord from the key will sound more … adventurous, than other chords). If your band / composing tastes are for two guitars as opposed to three, you can have the bass player play the roots of these power chords behind the harmony and you will get the same effect. We can also move our guitar harmony through different patterns along our guitar neck (you’ll need to know your mode shapes pretty well to make this easy). Make sure you understand how the above diagrams correlate to the tab before moving on – it’s important you understand the concept here! Cool! Hopefully you took the time to understand the process. 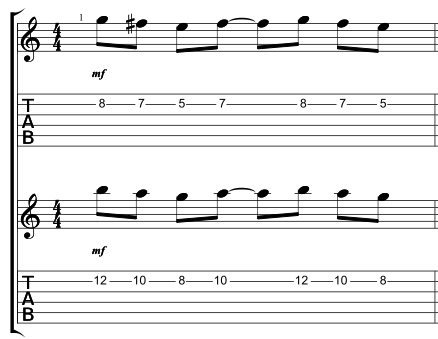 This also helps demonstrate how powerful it is to know your 3 note per string mode shapes. With the last example, we can also move the chords in the background. Leave any questions in the comments below and I’ll answer them as soon as I can. You can hear the audio examples here. By Sam Russell. Sam is a professional musician in West London. You can get his free book, “The Ultimate Guide to the Modes of the Major, Harmonic Minor and Melodic Minor Scales” which is available at: www.samrussell.co.uk/ebook.